Exit devices are differentiated as being fire rated (emergency) or non-fire rated (panic). The less expensive panic exit devices are installed onto a non-fire rated doors. 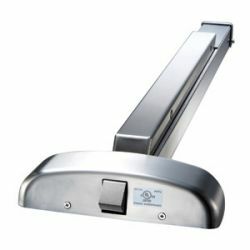 Fire rated exit devices are designed for installation onto fire rated doors. 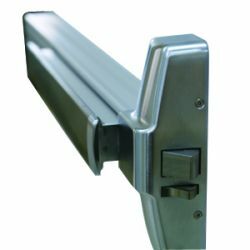 Fire rated exit device hardware is manufactured to accommodate the requirements for a fire rated opening. A fire rated exit device will have a fire label prominently located on the device often on the lock edge of the cover. If there is no label, the device cannot be considered fire rated. 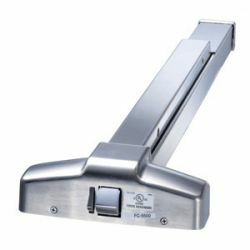 Fire rated exit devices cannot be equipped with mechanical dogging as a fire rated opening must be able to have the exit device lock mechanism to latch during a fire. Non-fire rated exit devices can be mechanically dogged using an Allen wrench type key. FC8500 UL Listed. ANSI A156.3, Grade 1. FC9000 UL Listed. ANSI A156.3, Grade 1. FC4000 UL Listed. ANSI A156.3, Grade 1.